For an exciting Great Lakes experience get onboard and be a part of “locking through,” the famous Soo Locks in the twin cities of Sault Ste. Marie, Michigan and Ontario. 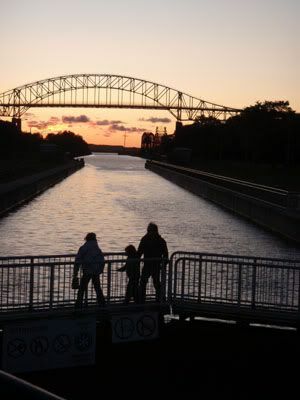 Step onboard a Soo Locks Boat Tour and ride through the locks between Lake Huron and Lake Superior just like the massive freighters that ply the waters of the Great Lakes every day. I had the opportunity to “lock through,” on a recent trip to the lovely city of Sault Ste. Marie, Michigan’s oldest city. Prior to stepping onboard for a Soo Locks Boat Tour we took in a birds-eye view of the city from the lofty, Tower of History, near the river. 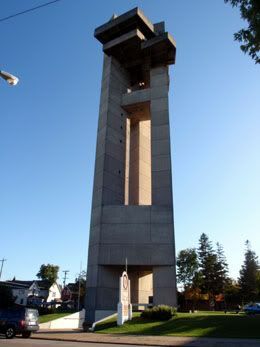 A short elevator ride whisks you 210 feet above Sault Ste. Marie. Four viewing platforms allow 20-mile panoramic views of the U.S. and Canadian waterfronts, and the world’s busiest shipping channel along the St. Mary’s River. Far down below we could see where the Museum Ship Valley Camp is moored. With 20,000 square feet of exhibit space, and over 100 exhibits, the Valley Camp gives visitors an exciting glimpse into life aboard a freighter, the rich maritime history of the local area, and the dangers of sailing the Great Lakes. An exhibit about the tragic sinking of the Edmund Fitzgerald in 1975 is also housed in the Valley Camp. From our lofty perch in the Tower of History, we could see our tour boat waiting at the dock for our arrival and headed down to the pier. Owner Rich Brawley and his crew welcomed us aboard the LE VOYAGEUR, for an evening dinner cruise on a cold and blustery late afternoon. We were glad to find a warm and inviting atmosphere once onboard the boat, away from the cold, gusty wind. The delightful aroma of our soon to be supper, filled us with anticipation of a hot, hearty meal as we cruised along taking in the historic waterfront. After a delicious buffet of roast pork, and baked chicken, with all the trimmings, it was time to make our way through the locks. Not wanting to miss a thing, most of us bundled up and braved the cold wind up on deck as we entered the locks. The St. Mary’s River, the only connection between Lake Superior and the lower Great Lakes, has a 21-foot waterfall on the river that had made it impossible for large boats to travel between the Great Lakes. In the mid 1800s two small locks were built, but with the rapid growth of commerce, shipping on the Lakes soon outgrew these small locks. Eventually the U. S. Army Corp of Engineers built the current locks, which can navigate 1,000-foot freighters easily around the 21-foot waterfall. As we approached the locks we could see deep into the concrete channel ahead. Our tour boat glided into the lock with another boat coming in behind us. We watched as the gates closed behind us. At first it seemed we were just sitting there but soon we noticed the water rising along the thick concrete walls. In about 15-20 minutes we were setting 21 feet higher and the gates in front of us opened up and we cruised out of the lock, down the channel and back out into the river. We continued our trip along the waterfront and soon came up next to a huge freighter unloading cargo. By the time we turned around to head back through the locks for the return trip, it was dark. Owner Rich Brawley sat down with a couple of us, and pointed out a freighter cruising not far from our boat. It was almost imperceptible to our untrained eyes, the lights on the ship looked as though they were just lights along the shore. He said at night the crews have to be extremely vigilant because everything looks so different in the dark. “You have to re-focus your eyes constantly because the lights at night can be deceiving”. Our excursion along the waterfront and through the Locks was a fascinating glimpse into a sailor’s view of navigating between the big lakes. The Soo Locks Boat Tour is a great way to really take in the waterfront along the twin cities and to ponder the significance of shipping and commerce along the Great Lakes that affects all of us. When in Sault Ste. Marie make sure you indulge in the local catch-of-the-day, fresh whitefish. Whether you like it grilled, broiled, planked or fried, Sault Ste. Marie restaurants do an excellent job of cooking up some of the tastiest whitefish you’ll find anywhere. The following restaurants, all located near the locks, not only serve up great whitefish but also offer a pleasant and enjoyable dining atmosphere: The Antlers at 804 E. Portage, Freighters Restaurant at 240 W. Portage, and Goetz Lockview Restaurant at 329 W. Portage. To satisfy your sweet tooth while visiting the Soo Locks, stop in for some fresh, creamy, homemade fudge at the Fudge Du Locke Candy Kitchens at 319 W. Portage. And for one of my favorite Michigan ice creams, try a couple scoops of Mackinac Fudge while in Sault Ste. Marie. 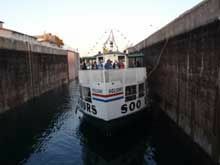 The Soo Locks Boat Tours operate 7 days a week during the normal season of May through mid October, and take about 2 hours. No passport is needed to travel through the Canadian locks. 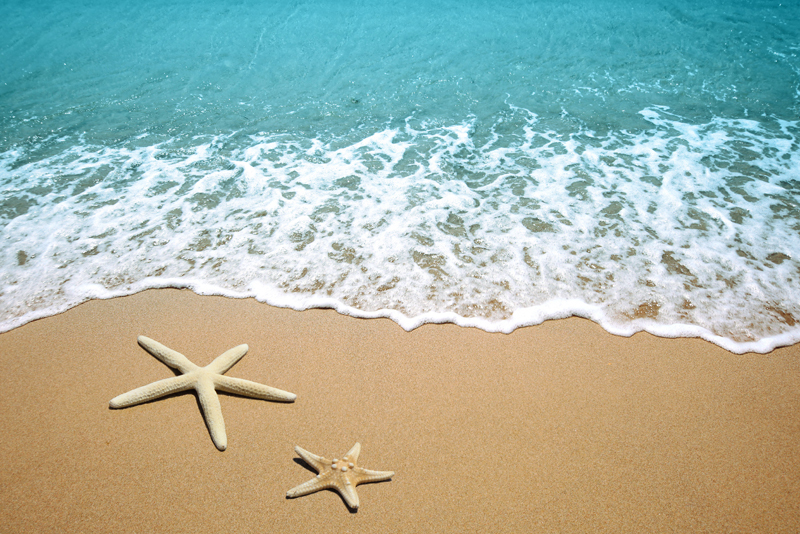 After October 15th departure days and times vary. 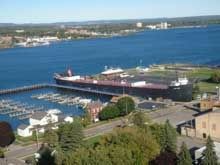 For more information visit: www.soolocks.com, E-mail: sales@soolocks.com, or call 1-800-432-6301.